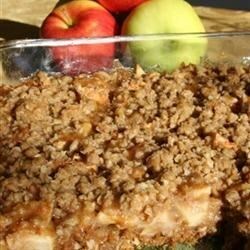 A fall favorite with baked apples and gooey caramel. A great rainy day project! Preheat oven to 350 degrees F (175 degrees C). Grease a 15×10 inch jellyroll pan. In a large bowl, combine the flour, quick cooking oats, brown sugar, and baking soda. Stir in the melted butter. Mix until crumbly. This is the crust. Press 1/2 of this mixture into the prepared baking pan. Bake for 8 minutes in preheated oven. In a small pan, over medium heat combine the caramel topping and the remaining 1/2 cup of flour. Stirring constantly, bring to a boil and cook for 3 to 5 minutes. This is the caramel filling. 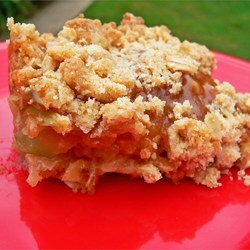 Spread apple slices evenly over the baked crust. Sprinkle on the nuts. Then Pour the caramel filling over the apple layer. Crumble the remaining crust mixture over the top of everything. Bake again for 20 to 25 minutes or until golden brown. Cool before cutting into bars.